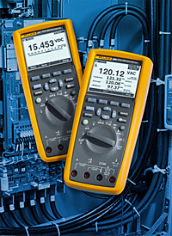 The new Fluke 287/289 true-RMS digital multimeters were designed for those of you at the top of your field. The instruments replace our popular 180 Series, with all the same features, plus more. The two multimeters perform advanced unattended data logging, and show trend data on screen without having to download to a PC. TrendCapture helps engineers and technicians track down problems faster during (for example) preventive and predictive maintenance. An extra-large screen shows results graphically, backed by an enhanced user interface with on-board help (i-info key) available in seven languages, and soft-key interface. Both meters can log multiple sessions unattended in the field, with logged readings being reviewed without a PC. Both come with a lifetime warranty.